HFP’s Rene Teijgeler has written an article on Gariwo.net entitled “Salvare l’arte, promuovere la pace”, which can be found here. HFP’s Esper Sabrine was interviewed for Radio Cataluny (April 17 2015) here, and by ARNDigital (April 13 2015) here. On April 14 2015, HFP participated in a Q&A at Franklin University, Switzerland, in a course entitled “Visual Culture of Disaster” and was interviewed on Cadena Ser on April 10 2015 here. 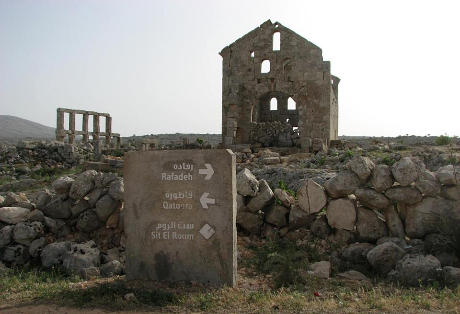 There is continued vandalism around the church complex of St Simeon, in the countryside near Aleppo, the DGAM reports on April 18 2015 here. Female Jihadists have set up a military training camp at Saint Simeon Byzantine Church in Aleppo Province. See the International Business Times article by Gianluca Mezzofiore and Arij Limam (April 10 2015) here. Ancient Villages of Northern Syria, Idlib. A photo shows the destruction of the door of a Byzantine Tomb in Shanshara. Protect Syrian Archaeology, April 18 2015. Details of saving some ancient objects of Deir-Alzour/Deir El-Zor Museum by Ayman Slaiman have been shared from Eyes on Heritage (April 18 2015) here. 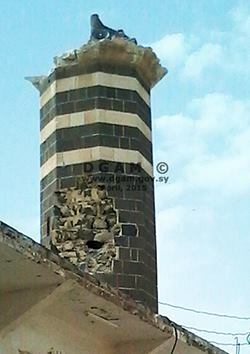 The DGAM reports that the minaret of the Al-Omari mosque in Daraa has been damaged due to a mortar strike. See details here. The DGAM has issued four reports on damage in the region of Daraa including photographs. The first on April 6 2015 covers damage at Al Taiba in particular has suffered some serious vandalism here. The second on April 11 covers damage at Garz railway station, here. The third addresses damage to the late Roman structures at al-Mataiya, here. The fourth covers illegal digging at Khirbet al-Qinah and Khirbet al-Suhb here. These can also be found on DGAM’s Facebook page here. New footage and photos show shattered mosaics and walls at the Unesco World Heritage Site of Bosra shared in Travel Journal by Lizzie Porter (April 14 2015). These details can be found here. Interview with the director of the archaeology department in Bosra was shared by Protect Syrian Archaeology (April 22 2015) here. See International Activity section for included notes on looting. The DGAM reported on April 5 2015 that their personnel have managed to return to work on the citadel in Bosra and thanked the local community for their help in protecting the archaeological sites in the area. See here for more details. UNESCO held a meeting with group of heritage experts to help safeguard heritage in Syria and Iraq, discussing increased information-sharing and cooperation together to enforce the February 12 UN security council resolution. Details can be found here. The head of UNESCO, Irina Bokova, has called on the younger generation to protect world heritage, which can be found here. On April 16 2015, an UN anti-crime meeting in Doha discussed ways to stop the trade in stolen goods. For details, see here. ASOR has released its 35th and 36th weekly reports from the Syrian Heritage Initiative, giving detailed analysis of the state of Syria’s heritage sites, which can be found here and here respectively. On April 14 2015, the Royal Ontario Museum convened a panel of experts to discuss ‘Cultural Genocide in Iraq and Syria’. A discussion of the event can be found in the Globe and Mail from April 17 2015, here. The National Post on April 20 asks whether museum curators should buy artefacts implicated in the funding of terrorism, in an article found here. On April 17 2015, the BBC discusses the call for an international response to IS’ looting here. Christopher Jones on Hyperallergic (April 17, 2015) assesses the issues around any prospective international intervention against ISIS for the purpose of safeguarding culture. See the piece here. CBC (April 14 2015) discusses the efforts of curators to save heritage from destruction, here. BBC Arabic (April 9 2015)has published an article (Arabic) by Andrea Watts on artifacts trafficking by the Islamic State. BBC Arabic by Andrea Watts, which can be found here. Julie Lowrie Henderson for PRI (April 8 2015) provides discussion about whether it is right to return artefacts to their countries of origin in times of war, here. Conflict Antiquities is reporting that ‘Civilians may have been kidnapped and exchanged for arrested paramilitary antiquities looters in Syria’ (April 7 2015). The New York Times opinion pages offers a short piece on April 5 2015 entitled “A War Zone’s Ancient Past at Stake”. CounterPunch on April 2 2015 asks whether countries should stop repatriations of antiquities to war-torn regions, here.